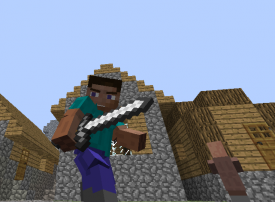 "Express yourself in Minecraft with this interesting Animated Player mod." With this interesting mod for Minecraft, replace the player animations with more expressive, fluid, and overall more interesting animations for your player and other players in Minecraft. 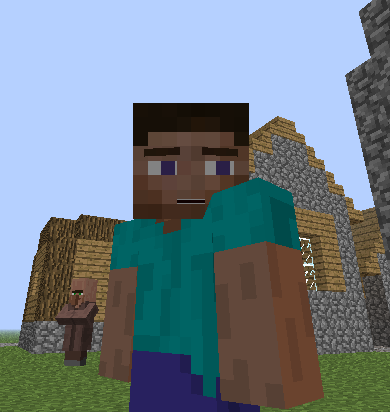 For most people, the static, non-changing face in Minecraft can seem a bit boring and perhaps even not enough when it comes to personalizing your character within the game of Minecraft. The Animated Player mod makes it so you can see which direction a player is facing by the character eye movement, whether the character is feeling hungry or confident/aggressive based on it's eyebrows, and whether the character is tired/out-of-breath by displaying a panting animation. While eye movement, expressive eyebrows, or panting are a few cool added animations, that's not all. The characters also has more fluid body animations while walking, running, swimming, jumping, sneaking, flying, riding, bow-aiming, blocking, climbing, hitting, eating, and drinking. This allows this to almost completely transform how your character expresses itself within the game, and how you express yourself while playing Minecraft. The Animated Player mod for Minecraft is a client-side mod. This means this does not get installed on the servers you are playing on, and makes it safe to use while playing Minecraft. This also means that only you can see these animations unless your friends also install the Animated Player mod on their Minecraft installations. While some mods for Minecraft come with extracting installers, the Animated Player mod does not. Installing mods on Minecraft requires you to have some knowledge on the installation of Minecraft mods. These instructions can be found by a simple Google search and are pretty easy to learn for even a novice PC user.